Routing with thunderball is a multi-tier system that involves routing with both express routes, and using react-router routes. manifest.browser.page.path: This is the route that will be matched by the thunderball server, and will be matched by express (see: https://expressjs.com/en/guide/routing.html for more about express routing). Note the * in our example path /login*. This says "match anything that starts with /login"
manifest.browser.path.createRoutes: This is a path to the module&apos;s createRoutes file that specifies the react-router routes for the SPA. 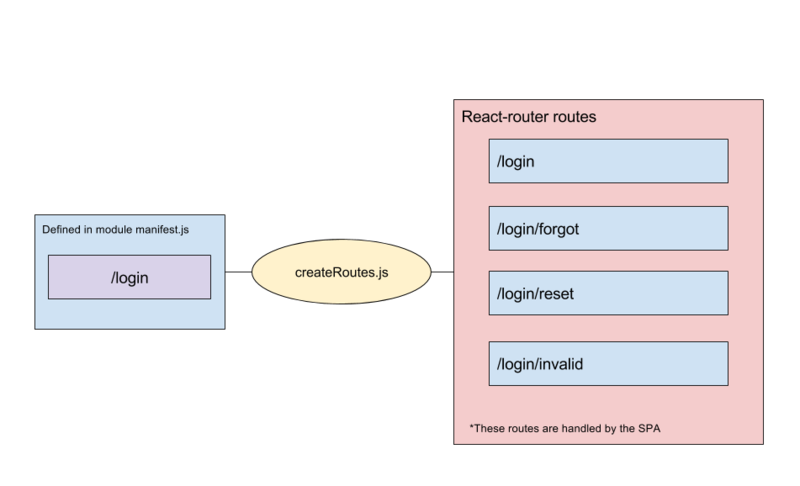 What&apos;s going on here is that we&apos;re specifying that "At any route matching /login* (starting with /login), serve up the SPA routes (react-router) routes specified in createRoutes. It&apos;s helpful here to remember at this point that since thunderball "pages" are actually single page apps that contain their own set of react-router routes inside them, when a user navigates inside those routes they&apos;re requests are handled by the react-router, and will not be making a round trip to the server. The request is received by the thunderball server. The route is matched (found) because we specified /login* in our module manifest. The page is then rendered on the server, and pulls in the routes we&apos;ve defined in createRoutes.js. The rendered page (single page app) is sent to the client as HTML and run in the browser. Once the browser is running our page (SPA) any requests made to routes inside the SPA (defined in createRoutes, ex: /login/forgot-password) are handled by the page, and a request is not sent to the server. When creating links inside your react router, use the <Link> component provided by react-router. When traversing links using other components, like `<Button>` use `router.push`. With this configuration the myModule module will serve anything in he /myStaticContent directory at the /my-static-page url. In this example we&apos;ve created index.html inside the /myStaticContent directory, so visiting /my-static-page in a browser will serve the index.html file. Likewise, if `/myStaticContent had any subdirectories, they could be accessed from this path as well. NOTE ABOUT MIDDLEWARES: It&apos;s important to remember that express middlewares are implemented at the server level, meaning they have the ability to intercept ALL requests to the server and act on them. This could alter functionality outside the scope of the module declaring the middleware whether it&apos;s intentional or not. Be mindful of this when implementing middleware in your modules. Another thing to note about this manifest.js file is that it doesn&apos;t have a browser or a staticDirectories property. That&apos;s because these are actually optional! A thunderball module doesn&apos;t need to provide a SPA route, or static route. It can provide any or all of these. For example, if your module only needs to provide a single middleware or some static content, that&apos;s cool. If you&apos;re module needs to create a SPA with static content and middleware to support it, that&apos;s cool too. As you can see it simply adds a header and follows the convention outlined for express middlewares. Since you are exporting a function that returns the middleware, you can also do any additional initialization or set-up for your middleware here as well. By providing the ability to create an SPA, host static files, or create and bind express middleware, thunderball provides a full platform for full-stack app development.